I was bitten by the horse bug early. One of my earliest memories of life is going on the pony ride at the Vancouver Zoo. This initial introduction to horses ended with me falling off when the pony got spooked by a passing truck. Undaunted, I got back on that pony and never looked back. When I was twelve I inherited my first horse from my father. You could not possibly pick a worse first horse for a child. Hadiya was a purebred Arab with a spooky temperament and not a lot of training. In those first years together, we spent a lot more time going backwards and sideways than forwards. Things changed when I started taking regular lessons with a local dressage trainer, Rebecca Garrard, and my lifelong passion for dressage began. In 2003, I purchased my first young horse. Wolkenstar was a three year old Canadian Warmblood mare with very little handling. I had never broke a horse myself before, but Star’s gentle disposition made it easy. Under the tutelage of Equine Canada Level 2 Coach Monique Fraser, I broke Wolkenstar and completed my Equine Canada Level 1 coaching exam on a leased horse. When Star turned 4, I decided to take my first stab at breeding and the next year my first foal, Forte, arrived. 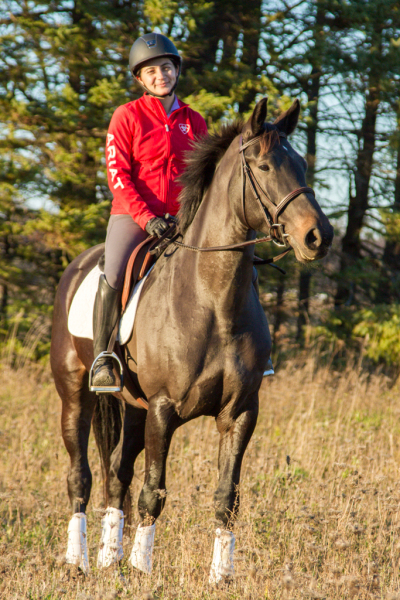 Wolkenstar went back under saddle and together we had a string of successes in the dressage ring including numerous championships and year end awards under the guidance of Level III Coach and Canadian Team rider Karen Pavicic. Wolkenstar eventually moved onto a new rider and her place in my life was filled by several other horses over the years, including her ¾ sister Wolte and her daughter Forte and grand-daughter Fortuna. With Forte, I have earned my Dressage Canada Silver medal at Third Level and look forward to eventually showing her at Prix St. George. In addition to dressage, I have also started dabbling in eventing. I hope to make my eventing debut with Forte in 2017. I have been teaching riding lessons and training horses professionally since 2003. I have taught everything from tiny tots on ponies to accomplished dressage riders. My students have gone on to win many ribbons and championships including the 4 year old division at the B.C. Provincial Dressage Championships and Escarpment Dressage year end awards. However, my speciality is working with young horses. In addition to my experiences as a dressage rider and coach, I have worked as a veterinary assistant to a prominent equine vet and even as a hot walker at Hastings Racecourse! I have also spent time volunteering at Pony Pals Therapeutic Riding Association, working with children with Down's Syndrome and cerebral palsy. I am proud to announce that in 2016 I also became an Equestrian Canada recorded dressage judge. In my life outside of horses, I have a life long interest in language and communication. I hold a Bachelor of Arts degree double majoring in Linguistics and Germanic Studies. In 2010, I completed my Masters of Science in Audiology at the University of British Columbia and currently work part time as an audiologist at Helix Hearing Care.